Figuratively tickled pink, of course. I have received the third place award in the United States Army Combined Arms Center 2015 General William DePuy Writing Competition. I shall surely provide a link in the new year, when it is scheduled to be published. Many thanks to LTG Robert Brown and the staff there for the opportunity to contribute to the debate. I think some readers of this blog will be very interested in the topic, which I've addressed here for many years. On a personal note, it was gratifying to get this news. In the spring I finally decided I really needed to work more on writing than blogging and set my mind to getting published after a long gap. So there you go. I'm confused about the Iran nuclear deal. Our Left said that the war President Bush initiated with Congressional backing against Iraq in 2003 was a lesson to every dictator that they need nuclear weapons to deter an American invasion. Yet President Obama overthrew (without Congressional approval) a dictator in 2011 (getting him killed will do that) who had voluntarily given up his nuclear and chemical weapons program under a deal with President Bush. And President Obama concluded a deal that supposedly disarmed Syria of chemical weapons in 2013 yet this year trains rebels and says we could use air power to protect them. Which may explain why Syria still has non-covered (by the deal--but still banned) chlorine gas to use and why there are indications Assad didn't turn over all banned material. Yet Iran, which still claims we are their foe (and has waged war on us for decades, killing hundreds of our military personnel in that time), agreed to give up their longstanding objective of a nuclear deterrent in this latest deal despite these lessons we've taught. Gosh! How did that happen? Throughout the process, President Obama’s chief negotiators ignored nearly 40 years of open Iranian hostility toward America and our allies. They also chose to ignore the fact that Iran has repeatedly broken the terms of its previous international agreements — breaches that prove Tehran’s word is worth only as much as the paper it’s written on. We retreated on ballistic missiles, enrichment, inspections with terms that don't allow Iran to cheat as easily, and an open-ended nature to stop--not delay--Iran from going nuclear. Naturally, the Iranians believe that once we start retreating, there is no logical stopping point. Is it any wonder they believe God is on their side? So they've got that going for them. Which is nice for them. UPDATE: We dropped our demands and flopped like a fish. So now we have nuclear nonsense. If Russia can flesh it out, the skeleton of an offensive army they are building could be used to launch a drive on Kaliningrad. The Russian Defense Ministry is in the process of creating new, expanded armies, said the Russian news agency TASS today, August 11. In addition to the 14th and 6th Air Force and Air Defense Armies created in the Western Military Disctrict, Russia is also forming the 1st Tank Army and the 20th combined army by December 1. The 1st Tank Army will incorporate the Tamanskaya Mechanized Infantry Division and the Kantemirovskaya Tank Division, as well as the 27th Sevastopolskaya Mechanized Infantry Brigade and the 6th Tank Brigade. "Reformatting the 20th Combined Army, which has been stripped of most of its combat units, is a more complex task," the source said. "At the moment it has incorporated the 9th tank brigade in Nizhny Novgorod. Other tank and mechanized infantry brigades for that army are being formed." These aren't new formations, I don't think, but new headquarters to command existing units. Although 20th Combined Arms Army headquarters appears to be new. And while they say new brigades are being formed, I really doubt Russia has the money or manpower to do that. Nor do I believe these units will be equipped with the new Armata suite of advanced armored vehicles, as the story states. But two armies (corps in our usage, I suppose) with 7 maneuver brigades and supporting units such as air defense, fire support, helicopters, and engineers, each and two air forces (with ground-based air defense units, too, it sounds) to support them is a potent offensive force just with the mass. And they'll have another tank army formed by December around Moscow that is probably the strategic reserve. Of course, these units have to be well trained to be really potent against a good army supported by a good air force. So far, only the Russian airborne force and their Spetsnaz special forces are good quality troops. By the end of February of this year, it reported, the Russian government had paid out death benefits to the families of more than 2,000 Russian soldiers, and disability benefits to more than 3,200. This is based on a Russian story that was subsequently taken down. I just don't believe that figure is possible. Sure, I can believe several hundred have died in the last year and a half. But 2,000 in just a year? When I don't think Russia has committed more than 6,000 or so troops at any one time (if memory serves me), that represents a slaughter. We never lost a thousand in a calendar year during the Iraq War with up to 170,000 troops fighting. Yet Russia lost 2,000 during intermittent fighting with a much smaller force? I don't think so. Nonetheless, Ukraine's ability to resist Russia's aggression in the Donbas demonstrates the weakness that a good army could exploit. Poland might build that good army that NATO's air forces could support until other NATO ground units can move east to help. But again, against a weaker enemy they could push them around. As we look at the Russian threat, Belarus should be a major subject of study. Belarus is a former Soviet state whose independence puts a sizable buffer between NATO Poland and Russia. And as I've noted for both the defense of the NATO Baltic states and friendly but non-NATO Ukraine, Belarus in Russian hands (or friendly to Russia) threatens the eastern flanks of the Baltic states and the northern flank of Ukraine. Yes. Poor Belarus. So far from God and so close to Putin. As well as giving heartburn to the Baltic states, Poland, and Ukraine, which lie beyond the borders of Belarus. While Russia holds their ground in Kaliningrad, surrounded by NATO. Meanwhile, we're congratulating ourselves for scattering the equipment for a heavy brigade across multiple countries in eastern Europe. So the whole carbon credit nonsense is pretty much a scam. Crooks and scam artists got rich, insufferable Greens got to buy indulgences to continue their lifestyles while pretending they have zero carbon footprints, and by their own definitions made the climate worse. It's a green hat trick! I've always been contemptuous of the whole carbon credit scam. Although that seems to completely go over the heads of the people at the Carbon Rapture Capture Report that consistently rate my carbon credit posts as positive. Oh, and you totally know that Greens will oppose technology to pull carbon from the atmosphere ("A new method for taking carbon dioxide directly from the air and converting it to oxygen and nanoscale fibers made of carbon could lead to an inexpensive way to make a valuable building material—and may even serve as a weapon against climate change.") if the choice is between the Green Religion of enforced poverty to reduce carbon emissions by making other people live simply or a world where we use as much fossil fuel as we like without harming the planet (under their own definitions). Now go and emit no more.Glory, glory, carbon credit! This is the point we tell these goons to qwerty themselves--vigorously--isn't it? We will actually run tests to see how the old A-10 stacks up against the just-deploying F-35 in the ground support role. But the question really isn't about whether brand new high-tech plane can place bombs on target better than a more-than-three-decade-old plane. The question is can the Army trust the Air Force to use the F-35 for close air support role. The Pentagon's Office of Operational Test and Evaluation said late Thursday that it would run tests to evaluate how the F-35 stacks up in close-air support vs. the A-10, according to Defense News. The tests will use the latest upgrade of the 3F software for the F-35 and take place in 2018. Does anybody really expect the F-35 to really lose that contest? Even if it isn't rigged against the A-10? Obviously, the rugged A-10 will excel in operations on the deck against enemies without effective air defenses. But I have no doubt that the trained pilot of a stealthy F-35 can drop JDAMs from high altitude in a high threat environment better than the equally trained A-10 pilot can do that. But that isn't the issue. I'd rather have the Pentagon evaluate the sincerity of the Air Force to really care about close air support. Because even if the F-35 is hands down the best ground support aircraft in the entire world, will this multi-role aircraft really be devoted to the mission that the single-purpose A-10 excels at? Oh sure, the Air Force promises that multi-mission aircraft will continue to support the "mission" of ground support even when the asset designed for that mission is gone. Yeah, I'm sure when the Air Force is prioritizing missions for their scarce multi-mission aircraft that ground support will be high on the list. But by killing the only aircraft specifically designed just for ground support, the Air Force is very clearly telling us what their priorities are. The Air Force is essentially telling the Army (while denying this to Congress) to have a nice life--but goodbye. To think they were once the Army Air Force. The Air Force can do the job of supporting ground troops. I remain impressed with how good a job they did throughout the Iraq and Afghanistan campaigns. The debate isn't about aircraft capabilities. The debate is about trust. Now that a gay, African-American, Obama-supporting, al-Qaeda sympathizing man has killed two white people for the purpose of fighting a race war, can we finally accept that the fault of murderers lies with the murderer and not a vague "culture of hate" that supposedly drove them to murder? There is no debate about whether this is domestic terrorism or a crime. Well, not unless they find a Rush Limbaugh book on his library card record. Then Katie bar the door. While I sympathize with the complaints about the vast difference in how the media covers this crime compared to the Roanoke murders of 9 African Americans by Dylann Roof that Flanagan claims inspired him to kill, I am enough of an optimist to hope that this is a teachable moment, as our friends on the left like to say. Flanagan claims that the church murders in Roanoke led him to kill two people he conveniently had a long-standing Bizarro World grudge against. Roanoke was the excuse to kill them and cloak the murders in a so-called higher cause--not the reason for their murder. How could it be the cause when the Roanoke African American community refused to create that climate of hate as they coped with the murder of their church members? Just where is the climate of hate to "explain" Flanagan's motivation? Would you really dishonor that church community by claiming they created the climate? They did the opposite. They created a climate of forgiveness and restraint. Flanagan spit on that climate of faith and killed for his own reasons and from his own mental health issues. Absent specific incitement to kill, the fault with killers lies with the killers no matter how many times you ask "why do they hate us?" and conclude it is our fault. So Democrats "own" this killer as the first link concludes? To the same degree that Republicans "own" any killer rightly or wrongly associated with them (and almost always wrongly, I'd say), they do. What's it to be? A culture of guilt by (claimed) association? Or a culture where individuals are responsible for their actions? UPDATE: This is what I'm talking about. The man who shot Representative Gifford and others was not a Tea Party supporter no matter how often that is claimed by the Left. Some newsrooms are pushing back hard on the notion that the recent spike in police officer deaths is tied somehow to the anti-cop rhetoric of the Black Lives Matter movement. That's a sharp contrast from the press' more recent habit of tying Tea Party rhetoric to similarly deadly acts. Indeed it is a sharp contrast. North Korea seems to have backed down after initiating a cross-DMZ crisis by firing on loudspeakers broadcasting news across the border. Even the North Koreans seem to understand that the correlation of forces has tilted against them massively. I'll be more relaxed when I read a story that all 50 of those North Korean subs have returned to port, but so far it seems that North Korea has decided not to resume the production of Dead South Koreans Theater. So good. The North Koreans crippled some South Korean soldiers by planting a mine on the South's side of the DMZ to initiate this worrisome crisis, but at least they aren't dead. So just relatively good. South Korean and US troops staged their biggest-ever joint live-fire drill on Friday, including a simulated mechanised assault deep into North Korean territory, just days after the two Koreas ended a tense military standoff. South Korea said Thursday it would create a combined army unit with the United States, reportedly tasked with destroying North Korea's weapons of mass destruction in the event of an all-out conflict. In the event of a full-scale conflict, the combined unit would absorb a mechanised South Korean brigade and forces from the US division, which is armed with helicopters and other advanced weapons. Which flows from our earlier posture change that indicated to me that we were thinking about moving north in case of war rather than struggling to hold Seoul under the weight of a massive North Korean invasion. Of course, it makes no sense for a single division to move north. It only makes sense as part of a general advance north unless we want the single division to be the target of every functioning military unit that North Korea possesses. Certainly, the first stage of that general invasion would be carving out a no-launch zone north of the DMZ to protect Seoul from North Korean artillery. South Korea has lost their fear of North Korean military power. North Korea can kill South Koreans but conquering South Korea is beyond Pyongyang's power now. Heck, North Korea can't even make a decent snack pie. UPDATE: So China pressured North Korea to back down in the crisis? It's reassuring that China would do that. But it is downright scary that the Chinese apparently had to tug on the leash of North Korea to get them to heel. Seriously, was North Korea about to use their military? That sortie of 70% of their submarine fleet was no spur of the moment thing. Just what did North Korea intend? If North Korea is willing to pull the trigger despite their inferiority compared to South Korean, American, and Japanese military power, let's be careful about judging what is rational for North Korea's rulers and what is irrational. Do the North Koreans even know that their military is outclassed? As an aside, the picture captioned as F-16s on a bombing run is actually a picture of F-4 Phantoms on a bombing run. UPDATE: Given the Chinese option to invade North Korea, this development is more accurately filed under "logistics:"
China will open a high-speed rail line to the North Korean border on Tuesday, state news agency Xinhua said, the latest effort to boost economic ties despite tension between the countries. The line, under construction since 2010, will run 207 km (127 miles) from Shenyang to the border city of Dandong, which faces North Korea across the Yalu River, and will shorten the train journey from 3 1/2 hours to just over one hour, Xinhua said. That will improve China's ability to move and supply an invasion force a great deal. Until Thursday, the Democratic National Committee’s “Veterans and Military Families” website had as its only picture a shot from White House photographers during President Obama’s visit to Warsaw in 2011. The president had been cropped out, but faces of four elderly veterans wearing European-style military uniforms were visible above several paragraphs asserting the party’s “commitment to America’s veterans.” The Polish military’s White Eagle insignia was clear on the headgear of two of the veterans. Which recalls this embarrassing uniform confusion early on. It hasn't gotten better after more than 6 years. #AmericanVeteransMatter. Stratfor has an interesting article on Israel's hesitation to strike Iran's nuclear facilities. Which has dangerous implications. Will the deal require Israel to nuke Iran to preempt a nuclear threat? That is a real problem. That's why I figured Russia should have stopped at their Crimea takeover and banked the "style points" for that coup rather than risk exposing their military as less than impressive in a less successful campaign in the east. Stratfor's analysis is consistent with my view that Israel could come up with a strike option--if they think outside the box enough--but that only America has the ability to really wage a campaign of multiple strikes over a long period of time to smash up the infrastructure. Further, at some point, Israel may have to decide between a risky conventional attack that has a low chance of success against the likelihood that Iran might nuke an Israeli city with a high chance of testing whether or not Israel is a "one-bomb state." Calculations change a great deal when you substitute concern for your military reputation with concern with your continued existence. And this is where it gets really sticky. Some assume that Iran with nuclear weapons is no big deal because Israel's nuclear weapons deter Iran. I have deep doubts about that comforting notion. If Israel can't deter Iran, we have to think about what Israel's response to a nuclear-armed Iran will be. Remember, right now Israel has enough doubts about their ability to mount a strike against Iran's nuclear facilities. What will Israel's options be after Iran buys better defensive weapons after the long embargo on arms goes away. Already Iran is discussing advanced air defense missiles with Russia (Reset!). If Israel believes Iran will nuke Israel and if Israel believes their conventional option is too weak, Israel's only logical alternative is a counter-force nuclear strike on Iran's nuclear weapons and their nuclear infrastructure in general. That's the logic of the situation. Ah, dust off those old Cold War tomes on counterforce theory. At that point, our only hope is that the Bush-era Obama Option has been improved enough to allow us to mount a last-minute attack campaign to disarm an openly nuclear Iran as an alternative to a disarming nuclear strike by Israel. We at least have the ability to substitute large numbers of precision weapons for nuclear warheads. As we debate whether this deal will stop Iran from going nuclear, can we at least center the debate on the assumption that a nuclear-armed Iran is a bad thing? Because some of the deal supporters seem confused on this issue. As an aside, one good thing about the letter by nearly 200 retired admirals and generals who oppose the Iran nuclear deal. The Obama administration touted a supportive letter by several dozen officers. That actually gave me momentary doubt about my judgment sitting here as a civilian with only open-source information to judge the debate. The new letter makes me more comfortable that I'm not wrong to oppose the deal. Hopefully it has the same effect on others whose opinion matters most immediately. Just how close to midnight do we want the nuclear clock? So Ukraine followed our advice not to resist the Russians based on Georgia's experience with Russia in 2008? One, that this administration learned that lesson from the Russo-Georgia War of 2008 is amazing. The implication is that by fighting back, Georgia lost even more territory than they would have if they hadn't fought. In fact, Russia ended up holding exactly what they had before the fighting started--the Georgian provinces of Abkhazia and South Ossetia. It is far easier to argue that the poor showing of Russia's military against the ill-prepared (for conventional war) Georgian military when Russia plunged into the rest of Georgia and appeared to aim for the capital, Tblisi, convinced Russia to pull back and not try to smash independent Georgia for good. And I did offer advice based on a more accurate reading of 2008 at the time. But what about the advice, even though it is clearly not based on what actually happened in Georgia in 2008? Clearly, letting Russia carry out their nearly bloodless takeover of Crimea did not sate Putin's appetite and persuade him not to invade the Donbas. I know that Ukraine's military and government was in a state of paralysis when Russia invaded Crimea, but even if Kiev could send little, they should have sent whoever would obey orders to attack. Before Russia's invasion of Crimea, I outlined an immediate counter-attack into Crimea as the best response to invasion. I realized at the time that my outline was a paper exercise for a paper armed force and did not reflect reality of the ground. But in retrospect, I think Ukraine should have sent even a single company-sized unit, if that's all they had, to attack south into the peninsula and try to shame more to follow. And give heart to Ukraine's mostly support units in Crimea to hold in place rather than give up. Who knows? If Russia knew that they faced armed resistance right off the bat, they might have retreated their special forces from their scattered positions to hold just the Sevastopol naval base. Imagine how different the crisis would be if Russia was penned into Sevastopol only? Or perhaps Ukraine should have met the bloodless takeover with airlifts of humanitarian supplies to all the scattered Ukrainian units across Crimea, all being broadcast to the world, daring Russians to open fire and give lie to their polite mysterious green men propaganda. And Ukraine could send ground convoys even as we joined the humanitarian resupply mission. Whether armed or not, Ukraine should have responded quickly with whatever they had despite their weakness. Certainly, doing nothing about Crimea didn't prevent Putin from annexing that peninsula and expanding his war against Ukraine, which is still ongoing with casualties approaching 7,000. Russian Foreign Minister Sergei Lavrov said on Monday the United States has been sending "signals" that it wants to start mending ties with Moscow, badly strained over the past year and a half by the conflict in Ukraine. Ah yes, that vague "conflict in Ukraine" that has sadly "strained" relations. Which actually means the very specific Russian invasion of Crimea and Donbas and the annexation of the former. Lavrov says we want to "mend" relations as if this is our fault and somehow we have to make up for our failings to keep our relations reset shortly after that 2008 war. UPDATE: Here's an article that is quite wrong. Yes, Bush urged the Georgians not to fight the Russians in South Ossetia when the Russians massed north in August 2008. Georgia definitely erred by shooting first and falling into Russia's trap. And it was a trap unless you amazingly believe that the then-rusting Russian military managed to instantly respond to Georgia's foolish firing into South Ossetia with an assault right through to Georgia proper. But once Russia invaded the rest of Georgia, the Georgians absolutely had to fight hard to prevent the Russians from taking the entire country. Further, the notion that helping Ukraine resist aggression is telling Ukrainians to fight for us is nonsense. Ukrainians want to fight for Ukraine! They aren't dying for us. They're fighting and dying for themselves. They should be punished because we share the objective of halting Russian aggression? We should help them. Ukroboronprom made most of its money in the last year by building and refurbishing 2,000 vehicles and even more artillery weapons (guns, howitzers and rocket launchers). Another item in big demand is refurbished communications equipment. Ukraine has a lot of Cold War (pre-1991) era equipment which has been left unused and poorly maintained. This provided a pool of equipment that, with some skill and ingenuity, could be restored to usefulness. Indeed, I've noted that our new NATO members with their own expertise could help refurbish and modernize the old Soviet-era models. Ukraine does need capabilities to pull their weapons together like drones, electronic warfare, secure communications, and infantry anti-tank weapons. And I'd also add in anti-ship weapons to protect their coast from a Russian amphibious assault. I can understand not wanting America to fight Russia. I sure don't. But does that mean we shouldn't help others defend themselves? Which is what Bush did for Georgia. And I'll remind you again that after the Georgia War of 2008, Russia held no more than what they held before the war--the provinces of Abkhazia and South Ossetia. Isn't that the whole idea behind "leading from behind?" Now our policy should be "everyone retreats until our foes tire themselves or conclude they have enough?" Already Russia has taken all of Crimea and parts of the Donbas, which Ukraine had controlled. We can only dream of our current policies being as successful as those that responded to Russia's Georgia aggression. Assad has been forced back to Core Syria. It seems unlikely that Assad can hold even this, given the casualties he has suffered. 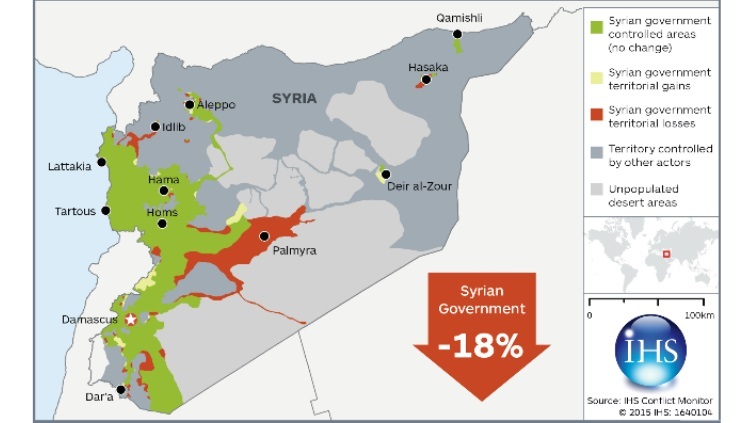 Territory fully controlled by President Assad’s forces has shrunk by 18% between 1 January and 10 August 2015 to 29,797 km2, roughly a sixth of the country, according to the latest data insights produced by IHS Conflict Monitor. In a recently televised speech, President Assad admitted it was necessary to focus on holding certain areas of greater strategic importance, while sacrificing others. The key areas which Assad cannot afford to lose include the capital Damascus, the Alawite coastal provinces of Latakia and Tartous, and the city of Homs as the vital connection between them. These are likely to be defended, even at the expense of losing other major cities like Aleppo or Dar’a. This is essentially down to the Core Syria that I wrote Assad had to contract to in order to build an army capable of regaining control of all of Syria. But being forced back to this area after suffering simply astounding levels of casualties among his troops is not the same as contracting before suffering the casualties and preparing for an offensive. And yes, fighting for Aleppo was a bridge too far for Assad. At this point, because of the massive casualties, holding Core Syria is just a temporary line before retreating to Rump Syria in the northwest. And I did wonder if Assad was trying to prepare his supporters for such a contraction. So I think we should watch for a move by Assad to legally shift the capital from Damascus to the coast. That way, no matter how little territory Assad holds, he will still be in charge of legal Syria and thus hold the UN seat and all the legitimacy that comes with that status. I think Assad will ultimately attempt to hold a Rump Syria based on the coast but pushed inland for a buffer zone to Homs in the southeast of that territory and up the main north-south highway from Hama and up to positions as close to Idlib as they can hold. This will provide an inland buffer zone to help protect his core supporters. It will retain the coast so Russia can have a naval base. And it will retain overland access to Lebanon to keep even a Rump Syria useful for Iran. Ideally, the new safe zone in the north will allow non-jihadi rebels to control that area. And ideally Southern Front rebels with Western, Jordanian, and Israeli support can advance to Damascus to control the south. ISIL, unfortunately, would control the rest until the non-jihadi rebels can be strengthened to expand their control at the expense of both ISIL and al Qaeda and Assad, too. Unless Assad's military simply collapses under the strain before Assad can order a retreat. If Assad can't defend the territory he has with the troops he has, the only logical way to avoid defeat is to contract his territory to a size his military can hold. And do it before his military is too exhausted to hold anything. UPDATE: Is it too late for Assad to retreat to his corner of Syria? A growing number of soldiers and civilians in government-controlled areas of Syria are expressing rare public disaffection with the regime of President Bashar al-Assad. Noncombatants as well as the military in traditionally loyal coastal regions are complaining that not enough is being done to relieve enclaves besieged by rebels. The defeat at Tabqa--the first besieged enclave to fall--has clearly shaken Assad's supporters. If Assad's fate rests on his ability to relieve multiple besieged enclaves, he's in trouble. Retreating to Rump Syria may be Assad's best-case outcome at this point. It probably won't be his last stop. We'll see how long it takes for Damascus to become a besiegec enclave, too. Russia inherited the mighty Soviet fleet that would have contested control of the North Atlantic with NATO during a war. Now the high seas fleet is just sad. Commissioned in 1991, Kuznetsov was Russia's last new large warship. In the past 23 years, Moscow has managed to complete a few new submarines and small frigates and destroyers at its main Sevmash shipyard, on the North Atlantic coast. But many of Russia's current naval vessels — and all its large vessels — are Soviet leftovers. Kuznetsov doesn't have many years left in her. Her boilers are "defective," according to the trade publication Defense Industry Daily. Yet when she goes to the breakers to be dismantled, Moscow could find it impossible to replace her. For one, the shipyard that built all the Soviet carriers now belongs to Ukraine. It lies just outside of Crimea, and Russian forces did not manage to seize it. And Ukraine produces key components. Russia's blue water fleet situation hasn't gotten better since 2005 when I noted their weakness. Face it, for a country with such a long land border, Russia's naval needs are far more limited and local, with the priority to coastal defense and defending bastions for their nuclear ballistic missile submarines (SSBNs) to have a survivable nuclear deterrent. So if Putin wants big aircraft carriers rather than a fancy red sports car? Oh please God, let Putin try to build them. The war on ISIL drags on. The offensive against ISIL-held Ramadi drags on, although I retain hope that this is a prelude to a war of movement. The Jordanian armed forces contains 105,000 troops plus 65,000 trained reservists. It is a small force, but more effective, man-for-man, than any other [NOTE: any other Arab force] in the region. So Jordan has both a motive to destroy ISIL and the capacity to contribute forces to the coalition we are (mostly--excepting Iran and their hand puppet militias in Iraq) leading in Iraq. If Jordan would advance from the west while Iraqi forces press from the east, we could collapse ISIL control in Anbar and free up Iraqi troops for a Mosul offensive as local Sunnis armed and supported by us assume responsibility for local defense against a weakened ISIL. The assault began overnight south of Daquq, a town about 175 km (108 miles) north of the Iraqi capital Baghdad. The front line between the regional Kurdish peshmerga forces and Islamic State in northern Iraq has hardly budged for months. The Kurds aren't about to die to liberate Mosul--or other territory that will simply revert to Iraqi government control. So a big attack up there doesn't make sense until it is in support of an Iraqi drive that will move into Mosul at the end of the road. Multiple units that the coalition has helped train are participating as this fight, as you know, the 73rd and 76th brigades who were trained by coalition partners Australia and New Zealand, are doing very well to date, as are the approximately 600 Sunni tribal fighters who participated in the advise and assist program. This would fit with that earlier report that 3,000 coalition-trained troops are involved. The earlier cited article said they were American trained but that could be an error. Prime Minister Haider al-Abadi said the battle over the northern town of Baiji and its refinery - Iraq's largest - was critical to the fight against Islamic State. The town, about 190 km (120 miles) north of Baghdad, has been a battlefront for more than a year since its seizure by the Islamists in June 2014 as they swept through much of northern Iraq toward the capital. If that is secured, an offensive on Mosul could be carried out with US-trained Iraqi troops since we may not have diverted US-trained units to the Anbar offensive. We've disagreed with the Iraqis on whether to mount an Anbar or Mosul offensive. Iraq seems to have won that debate (and I agree with the Iraqis on this), but perhaps we also won in the sense that we successfully kept US-trained ground forces out of the Anbar offensive. Cavusoglu said the operations would also send a message to President Bashar al-Assad and help put pressure on his administration to come to the negotiating table and seek a political solution for Syria's wider war. This is progress. But this incremental escalation has a major flaw. While we say we want non-jihadi rebels to fill the vacuum, assuming our air campaign decimates ISIL, why do we assume that non-jihadi rebels rather than Assad's forces will fill it? Note that we say that we want this safe zone for rebels who will pressure Assad into negotiating. I believe that is a weak point in our plans to support rebels. Rebels will fight and die to win against the hated Assad system. We say we want them to fight and die to pressure Assad into negotiating a peace deal that presumably doesn't lead to Assad hanging from a lamp post. Yeah, is it any wonder that our training program doesn't seem to be pulling in many Syrian recruits under the terms we've set? Perhaps Turkey hopes to leverage this air campaign into a real safe zone held by Turkish troops when the air-only zone doesn't do the job. Yes, a no-fly zone protected the Kurds in Iraq after we defeated Saddam in 1991. But it didn't do the Shia in the south any good at all. The difference was the ability to hold ground. I certainly expressed my doubts that a metric of ground lost by ISIL really showed that we are winning. So the war goes on. It is mostly stalemate, but I give the advantage to ISIL on points because ISIL has the most significant successes by clawing against Assad in Syria and still holding the recently taken Ramadi (as well as expanding abroad which will help them recruit replacements for their losses to our air campaign). But that could change rapidly if--as I have to believe--we really do plan a war of movement in Anbar province despite the painfully slow advance taking place now around Ramadi. The Army needs to adjust to the fact that it will get far less funding than it needs and prepare for the day it will be sent to war despite that shortfall. I'm not comfortable arguing that the Army is paying for Air Force planes and Navy ships. One budgets for threats with limited money and you have to make choices. The Army has lost this battle for now. And no, suffering the most in our wars since 9/11 doesn't get the Army any credit. That's a sad fact of life. Not that I don't agree that the Army is underfunded. A Rand Corp. analyst warned Tuesday the U.S. could “regret” tackling the nation’s three largest security threats with the currently planned reduced Army force structure. Remember, one day in the future the question of sending our Army to war will be the debate. If somebody correctly states that we have to go to war with the Army we have and not the Army we wished we had, remember that right now we are building the Army we wish to have on that future day. And then we will send the Army we have to war. Whether or not we have the Army we wish we had at that moment. That's a fact of life that the Army must live with. Right now, Sweden is not NATO-worthy. Strategypage provides a summary of how they got this way. Swedes now realize that the Russian threat is now and it is growing. The Swedes are now more aware of their precarious defenses but have not really done much to remedy the problem. Going back to the old “reserve army” will require the reintroduction of conscription and that is not popular. It is really all up to the Russians. If they become a scary enough threat the Swedes will rearm, otherwise it is mostly posturing and angst. Perhaps Russia will give them the time. But joining NATO is not a substitute for rearming. The Obama administration is quietly reviewing the future of America's three-decade deployment to Egypt's Sinai Peninsula, fearful the lightly equipped peacekeepers could be targets of escalating Islamic State-inspired violence. Options range from beefing up their protection or even pulling them out altogether, officials told The Associated Press. The American forces have helped marshal peace in the peninsula since Egypt's 1979 historic peace treaty with Israel. Some 700 members of an Army battalion and logistics support unit are currently there. They mainly monitor and verify compliance, and have little offensive capability. Several other countries also provide personnel. This is not a United Nations force. We organized it. To responsibly end a war. It has been quietly doing its job. Notwithstanding fantasy rumors about it. See the web site of the Multinational Force & Observers. Jihadis are waging a war in Sinai against Egypt, aided by Hamas in Gaza. So there is danger. Call me cynical, but I wonder if we are floating the option of removing our forces--thus killing the whole mission--to pressure Israel into staying quiet on the Iran nuclear deal that Israel opposes. Or is it just natural to retreat from everywhere? That's possible, too. Egyptian President Abdel-Fattah el-Sissi, making his second visit to Moscow in three months, says he hopes for Russia's help in combating terrorism in the region. Assad described Russia as "principled", while "the United States abandons its allies, abandons its friends." He added: "This was never the case with Russia's policy, neither during the Soviet Union, nor during the time of Russia... Russia has never said that it supported President Such and Such and then decided to abandon him." Not that I worry that Egypt could flip to Russia. Egypt is still reequipping their military after flipping from the Soviet Union to America after the Camp David Accords that led to our Sinai observation force to keep the peace. But Egypt certainly has reason to hedge their bets. And Russia would love to improve their position in the eastern Mediterranean. Why expend so much effort to take Crimea from Ukraine if not to project power south? Thankfully, we have a lot of experience with disarmament deals with nutball regimes. Let's review. The WMD deal with Iraq was violated by Saddam who secretly kept WMD programs for a while, then refused to verify he no longer had active programs, and kept the ability to reconstitute the programs despite inspections. We went to war with Iraq. The nuclear deal with North Korea was violated by the Kim dynasty and now North Korea has nuclear explosive devices (if not deliverable nuclear weapons yet). North Korea repeatedly threatens us and our allies with destruction. And their regime make even regular nutballs look better by comparison. The WMD deal with Libya still left a psychopathic dictator in charge of a mostly de-WMD's state. We went to war with Libya. The nuclear disarmament deal with Ukraine worked. But sadly Ukraine probably regrets that decision given that they've lost significant chunks of their territory to Putin. The chemical weapons deal with Syria left a psychopathic dictator in power who still used chemical weapons inconveniently left off of the deal. The death toll mounts in Syria, jihadis run wild (and crossed into Iraq to take Mosul and the region), and our involvement against most sides in the civil war ratchets up. And now we have a nuclear deal up for approval with Iran. But this deal will work much better, we are reassured. But hey! We'll always have Khazakstan! Whether they'll retain that secure feeling as Putin casts longing glances their way, we'll see. And no, I don't count South Africa. For whatever reason they gave up their nukes, nobody had to make them do it. It's so odd. James Taylor didn't get the Legion d'Honneur for his response to an earlier terror attack. This is a much better ending than some weepy, self-absorbed #bringbackourtrainpassengers Twitter campaign. Venezuela is spinning into poverty and chaos. Should the Dutch be worried? Venezuela is slipping toward a humanitarian crisis. News of its latest economic low point, or of President Nicolas Maduro's most recent political tantrum, tends to eclipse this slow-motion disaster. Yet the danger of a Venezuelan implosion is growing. I know. An economic system designed by this man is imploding? It boggles the mind, no? The editors say that Venezuela's neighbors need to worry about chaos flowing out from a chaotic Venezuela. But it might be worse. What if Maduro tries to rally his hungry and toilet paperless people with a foreign enemy? It would be unwise to take on Colombia, whose armed forces are experienced after decades of war--that they are finally winning--with leftist/drug cartel insurgents. A threat to Panama would not work out well since we retain an interest in protecting the canal. Guyana is weak and Venezuela has a large territorial claim on them, but the Organization of American States would have to take notice of that kind of hemispheric violence. And Brazil? It may be true that Brazil is the power of the future--and always will be--but they are still capable of drubbing Venezuela. And there is the OAS thing. So who could Maduro target to distract his people and avoid angering a near power able to smash his armed forces? I think the Dutch need to worry about defending the Dutch West Indies from Venezuela. I thought so back in 2007. And the case for capturing these Caribbean islands is stronger today. Venezuela would gain traction with the claim that they are ending the last remnants of colonialism. So the OAS would likely be at least neutral. NATO is now focused on Russia. Would the NATO reaction force risk coming to the Western Hemisphere? Russia would be more likely to help Venezuela--if quietly--to harm a NATO nation and gain a bridgehead (militarily useless for Russia but good for image as a globe-spanning power). And are the Dutch really better prepared than they were back then? You never can tell whether Maduro will get tired of his Axis of El Vil Status and wants to make the jump to evil. The larger answer is that this is the end game of Chavismo. For about a decade, some sectors of the left hoped that Hugo Chavez represented an alternative to the neoliberal consensus on economic policy. 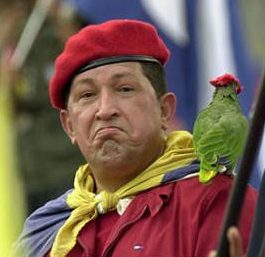 Every time I wrote that Chavez was in fact direly mismanaging the economy, diverting investment funds that were needed to maintain oil output into social spending, I knew that I could look forward to receiving angry e-mails and comments accusing me of trying to sabotage his achievements for the benefit of my corporatist paymaster. And in fairness (though without minimizing his appalling authoritarianism), those policies undoubtedly did improve the lives of some incredibly poor people. My question is whether hyper-inflation will be replaced by hyper-nationalism. And who will be the target? Maduro is stoking tension with Colombia, but it would be really stupid to tangle with their military. Listening to defenders of the Iran nuclear deal insist that without the deal Iran will go nuclear in a year drives me batty. Let me repeat, being able to go nuclear in a year (or any other time period) is a measure--imperfect since we are observing from afar--of technical ability to race to a nuclear device if the Iranians push the pedal to the medal. The assumption of defenders of this farcical nuclear deal that because Iran now has the ability to race to a bomb in a year that they will race to the bomb without the deal ignores that Iran has achieved this narrow breakout period for the last decade or so. And they have not pulled the trigger yet. So to believe this claim you have to assume that without the deal, whatever reason was holding Iran back in the past (lack of a warhead design, working ICBM, or adequate defenses?) from making the decision to race to a bomb will no longer hold Iran back. There is no reason to assume that. Or that a deal will change the calculations of Iran that have so far kept them from making that decision. It's quite possible Iran thinks they need a decade to get a warhead design, perfect and build an ICBM, and build air defenses, so buying that decade of time that keeps America from attacking them--and providing a cash windfall, too--is a great deal for them. So yes, no deal is probably better than this deal. It strikes me that if Israel really wants to hurt Hezbollah while they are occupied in Syria so heavily, that they have a window of opportunity between now and when Congress votes on the Iran nuclear deal. Iran has a lot of incentive to be on their best behavior (well, for them) in order not to undermine the willingness of members of Congress to back the president on upholding this awful deal. Although talks are going on between North and South Korea, am I making too much of the fact that the broke North Korea with a rotting military actually managed to put more than 50 of their hard to maintain and crew submarines at sea? They doubled their artillery and sent the majority of their sub fleet to sea? The former wouldn't be too difficult since you just have to tow stuff. It doesn't even have to work or have much ammo available. But putting subs to sea means they have to be crewed and seaworthy. That takes a good deal of time and a lot of effort to prepare. And they're old. They put more than 50 to sea. If that is accurate, of course. But this article says that 70% of North Korea's 77 subs are at sea and "undetectable." So they either submerged or sank. The official said he couldn't immediately confirm whether the North's submarine activity was one of its strongest since the 1950-53 Korean War. So this is unusual at the very least, if that question arose. As my 2012 The Military Balance assesses, "[North Korean] equipment is in a poor state, and questions remain over personnel training, morale and operational readiness." So even if this isn't the strongest ever deployment, the fact that it is being done now when their military is in such bad shape says a lot about the effort needed. Mind you, I don't think North Korea could win a war with South Korea and her allies--essentially America and Japan. I can't imagine that even North Korea's leaders are so lost in their fantasy world that they believe they could win. Although I'll admit that massive chemical weapons use and perhaps some nukes would give them a shot if it shattered the South Korean military and allowed the North Korean troops to carry out a nearly unopposed road march south. But the prospect of defeat might not deter North Korea's leadership. Perhaps the long collapse is finally coming close. Perhaps in response the North Korean leadership sees the alternatives as an uprising with a military unwilling to defend the regime on the one hand; and on the other, a losing conventional war with South Korea that rallies the people around the regime, decimates their own military which may be less than loyal, and rallies the survivors after a ceasefire. Remember, North Korea went to a strategy of kooks, nukes, and spooks--using spies to control their people and nukes to deter invasion--because the large military is unaffordable. But it really is a problem for the regime to starve the military of resources. So why not engineer the reduction of the useless for domestically dangerous army by South Korea? North Korea really just needs the ability to bombard Seoul--not advance to Pusan. And really, why would the North Koreans care if any of their submarines survive? Their most glorious use would be to demonstrate the horrible nature of their many enemies and end the money drain to keep them in service. This strategy for regime survival assumes we and the South Korea don't march north--even a little bit--and assumes China doesn't march south, of course. Perhaps North Korea does have some nukes that they believe could deter such a bad final outcome. Or they believe the threat of Chinese intervention will stay our hand. And remember, if we look at all kinds of indicators that would signal an invasion (and we do), North Korea could fool us because the North Koreans wouldn't need to carry out a lot of activities that we would detect if the purpose of the war is not to win a war but to safely lose and rally the people, decimate useless parts of the military and generally chop it down to size without releasing trained and possibly angry troops into the civilian world. Perhaps North Korea blinked over their 48-hour deadline for South Korea to stop their loudspeaker news broadcasts at the DMZ. Or perhaps Kim Jong-Un was simply overly optimistic that his forces could be put in position in 48 hours. Perhaps I just don't know nearly enough about what North Korea is doing and not doing to realize that my pucker factor shouldn't be rising to dangerous levels. UPDATE: The submarine deployment is indeed "unprecedented." The Pentagon said on Sunday it was aware of reports of an explosion at a U.S. military base in Sagamihara, Japan, but said it could not confirm the blast occurred on the base. During a crisis is a bad time to have explosive accidents. If it was an accident. South Korean President Park Geun-hye demanded on Monday that North Korea apologize over recent landmine blasts, even as the bitter rivals held marathon talks to defuse tensions that have brought the peninsula back to the brink of armed conflict. Are the North Koreans talking because they realize they made a mistake and want to talk back their threat? Or do they just need time? Question: where are the 50+ North Korean subs going? The Korea Strait to interdict shipping? To positions to unload commandos (which could be in Japan, too)? Sometimes people send in the diplomats to further war aims and not to avoid war. UPDATE: I've read some who claim suspending the exercises even for a short time reflected the Obama administration "blinking" in the face of North Korean threats. I disagree. If our troops are in the field on exercise (without live ammo, or little) and the enemy invades, those troops are dead meat if hit. It makes perfect sense to pause and see what is going on in case all Hell is about to break loose. We paused and then resumed the exercises. Although if we didn't see many of the indicators we believe we'd see on the eve of invasion, keep in mind my caveat above about what North Korea might be thinking. When Admiral John Kirby was a spokesman for the Department of Defense, he did a good job and seemed very credible. Now that he wears a suit and speaks for the Department of State, he simply seems to be rapidly going native as a spinner in service of denying the obvious. This is just a personal subjective observation. But it seems accurate. I just hope he doesn't have to start wearing pajama boy glasses. UPDATE: Well, he isn't up to the glasses yet. I've been writing for a long time that the outline of a nuclear deal between America and Iran has been painfully clear: Iran will pretend not to have nuclear weapons programs; and we will pretend to believe them. The Parchin side agreement (Remember, it isn't secret--we just can't see it) is a small but easily digested example of this level of pretending. The document, titled “Separate arrangement II” – which was referenced in a Wednesday AP story and published Thursday – indicates that Iranians will be allowed to inspect themselves for evidence of the nuclear work they conducted at Parchin [a][b]. Instead of allowing IAEA inspectors to collect evidence from the facility, samples will be collected by the Iranians using Iranian equipment. Instead of allowing the IAEA to collect everything it wants, only seven samples will be handed over from mutually agreed upon areas. Instead of giving inspectors access to facilities, photos and videos will be taken by the Iranians themselves, again only from mutually agreed upon areas. The side agreement is a farce. What kind of pressure was the IAEA under to even agree to this level of pretending to inspect? I wonder if someone at the IAEA leaked this in protest to putting their integrity into a blind trust for the duration of the deal. And you wonder why I worry about what the IAEA could ignore with different personnel in charge if this is possible now? So in the side deal, after the pretend inspecting is completed, Iran also agreed to a dog and pony show by the DG of the IAEA to Parchin--the only IAEA official to visit the site--to create the illusion that the IAEA inspected the site. The farcical inspections take place in the shadows--or they are supposed to, anyway. The purely "courtesy" visit is to take place under the glare of the photographers. Why would that be? And given my earlier joke, I'd really like to see every secret side deal. Why would our administration go to such lengths to pretend that this deal is so great? And why does our president assume we can't tell the difference between a real deal and his deal? We're screwed by this deal. And we're supposed to like it. Just lie back and think of presidential legacy! All things considered, Meg Ryan is an amateur at pretending. Nobody in the Obama administration deserves a Nobel Peace Prize for this sorry spectacle of a deal. But they sure should be in the running for an Oscar. Lafayette, We are Still Here! "Everything happened very fast," Anthony Sadler, a student travelling with friends Alek Skarlatos and Spencer Stone, both members of the US military, told France's BFMTV. The American stabbed by the would-be mass murderer is expected to recover. One, Skarlatos, is identified as a National Guard member without specifying whether he is Air or Army Guard. At least one man--the one stabbed--is a soldier, according to the US military. So that must be Spencer. The third American, Sadler, is a student. Earlier reports credited the Marines. I don't know if that is the result of many decades of very good publicity for that service that led onlookers to assume that a charging frontal assault must mean Marines! An American passenger was also shot. The men received medals from the French in gratitude. It may seem odd that the attacker pleaded for the return of his weapon, but after the Iran nuclear deal the attacker probably figured there's no harm asking. So far French authorities are not speculating on the motivation of the 26-year old man of Moroccan origin. UPDATE: Things are still unclear. Apparently, the man wounded is Air Force. Which conflicts with earlier reports. And there were Marines on the train who helped. Perhaps to help subdue the attacker after the other American responded? Early details are dodgy. Which is why I didn't blog it last night, figuring by the morning it would be sorted out. But not yet. But the big picture is there: American military personnel prevented a bloodbath. "If the identity he has declared is confirmed, he is a 26-year-old man of Moroccan nationality identified by the Spanish authorities to French intelligence services in February 2014 because of his connections to the radical Islamist movement." He is believed to have visited Syria. For the waters, I'm sure. The questioning should be informative. And followed by French air strikes, I'm reasonably sure. The second-in-command of the Islamic State jihadist group has been killed in a US air strike in northern Iraq, the White House said. Kayla Mueller, the U.S. aid worker killed this year while being held hostage by Islamic State militants, was raped repeatedly by the group's leader, Abu Bakr al-Baghdadi, while in captivity in Syria, U.S. officials said on Friday. The gunman who was disarmed by passengers on a train in France two days ago looked weak and malnourished and said he had only meant to rob people, a lawyer who interviewed him after the attack said on Sunday. Yeah, an automatic rifle and 300 rounds is standard for a robbery. UPDATE: Oh, and the attacker had a pistol and a box cutter. Chris Norman, a 62-year-old British consultant who lives in France, was also decorated by Hollande on Monday. Stone said another man, who is French and whose name has not been disclosed, "deserves a lot of the credit" because he was the first one to try to stop the gunman. The West dodged a bullet. This time. And sorry about the crack about lawyers. I know good ones. But the worst do give the profession a bad reputation among those who don't have contact with attorneys. They should just start calling themselves the "profession of peace," I suppose. UPDATE: I wonder if the unnamed French man is an undercover train marshal, or something.